When I was about ten, I was given an art book which devoted a whole section to the drawing of cars. And I remember turning those pages for the first time and coming across what I thought was simply the most beautiful thing I had ever seen. It was a bright red 1954 Mercedes-Benz 300 SL Gullwing. I immediately started to draw it, which, noting my artistic talent, meant the hour had not yet elapsed before I had committed gross injustice upon the image of the Gullwing. And the most baffling thing is that despite the misplaced lines, and the wrong perspective, and the abolition of any sense of proportion, it still looked beautiful. And to even focus on its awe-inspiring aesthetic is to forget what lay underneath: the revolutionary fuel-injected heart, at a 45-degree tilt so as to fit under the bonnet’s muscular bulges; the race-inspired tubular frame which precluded conventional doors; even the fact that the Gullwing could be a free and untamed beast at high speed. It was form and function in perfect harmony. 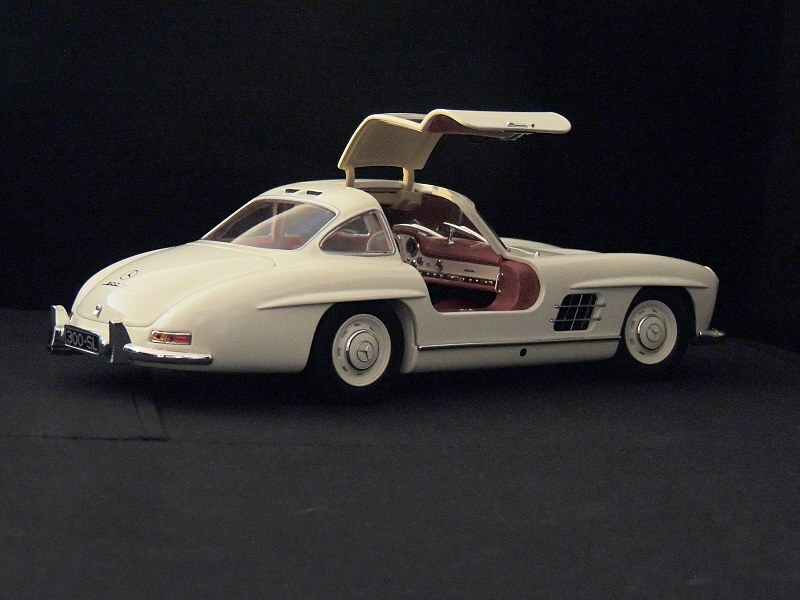 Naturally, one of my very first models, therefore, was a Gullwing – if only the Bburago 1:24 version, which on carefully stretched pocket money, was all I could afford. 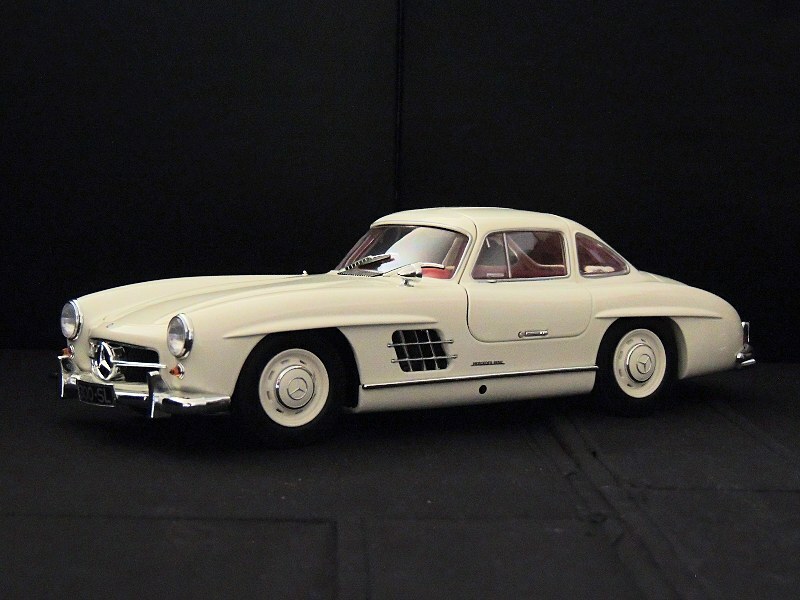 A few years later, having attempted to find a 1:18 model Gullwing from a more expensive brand, but failed, I ordered the Bburago 1:18 version, in red (A few months later, I also got the Bburago 1:18 Mercedes-Benz 300 SL Roadster). I certainly wouldn’t recommend them at all. 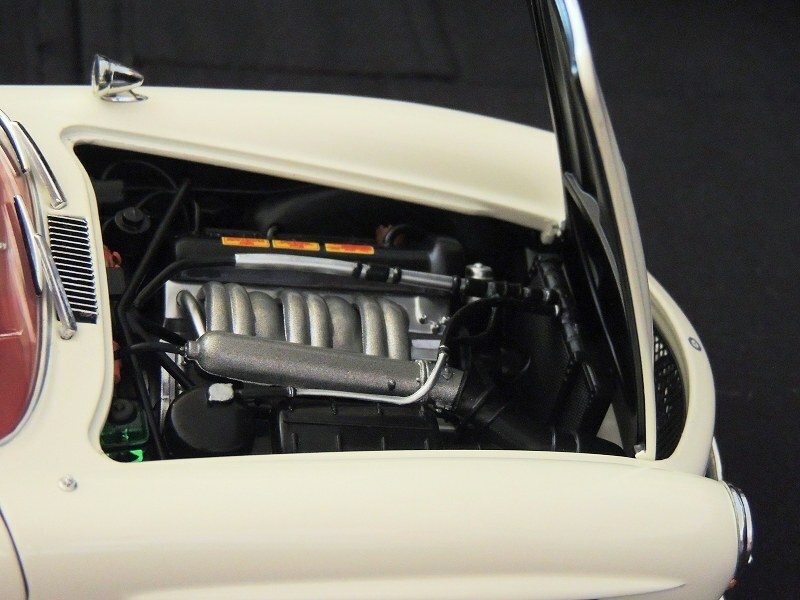 Because Bburago insists to sticking to ancient moulds for their older models, 300 SLs included, they are crude and cheap in every conceivable way, not least of which is the fact that most of the engine bay is beige plastic. Beige. They typical colour of engine components as far as I can determine. As you can probably realize, contentment with such a model lives on borrowed time. 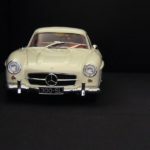 And so now, the privileged part of my shelf is occupied by the Minichamps 1:18 1954 Mercedes-Benz 300 SL Gullwing, in white. White wasn’t my first choice, but seeing as Silver and Red were long sold out, it was my only one. 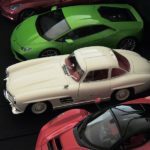 However, if you’ve been following the news on this website, you’ll have learned that Minichamps has just announced new colours for the Gullwing: a darker red as well as a blue, and a yellow. The yellow is terrible. It reminds me of what John Lennon did to his Rolls-Royce Phantom – and look what happened to him. 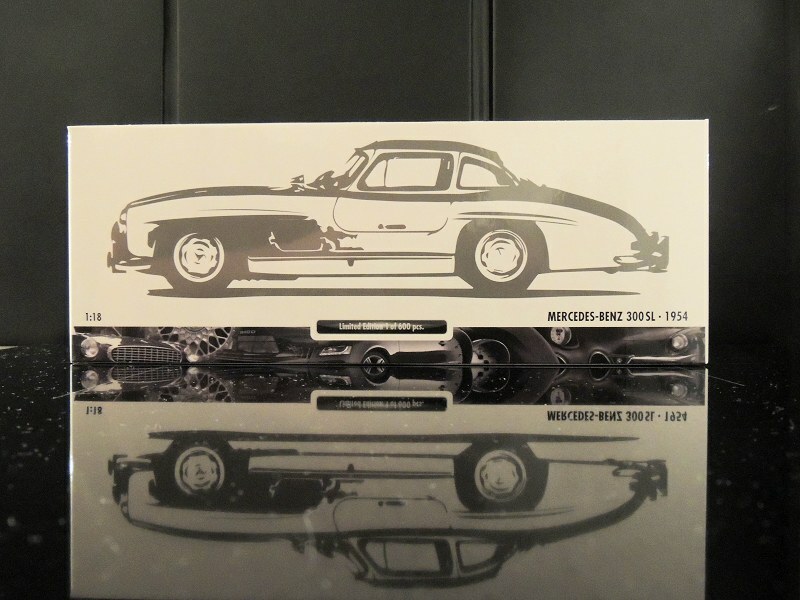 The Minichamps Gullwing comes in a smart, rather small, white box with profile sketches of the Gullwing on the sides (Though it still claims to be a box for some racing BMW). The model itself is encased in Styrofoam, with at least 50 clear stickers holding down the opening parts. One of the first things to notice when removing the model from the box is how heavy it is! I think this is mostly due to the fact that the undercarriage is just one white metal plate, etched in parts. Those who want to see the undercarriage mechanicals will be disappointed, but I for one am rather impressed with the solid, quality feel it delivers. Interestingly, though, they didn’t do the same thing for the Roadster version. So somebody complained. Any ideas who it was? The exterior of the model is, on the whole, nicely finished, but there are a few bones to pick; one of which is the occasional paint blemish. The others would be the small black studs in the rear lights, as well as the somewhat unremarkable finish to the front indicator surrounds. 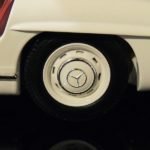 On the similarly priced (and styled) AUTOart 1:18 1955 Mercedes-Benz 190 SL, the front indicators are encased by chrome and then what would be the black rubber seal. 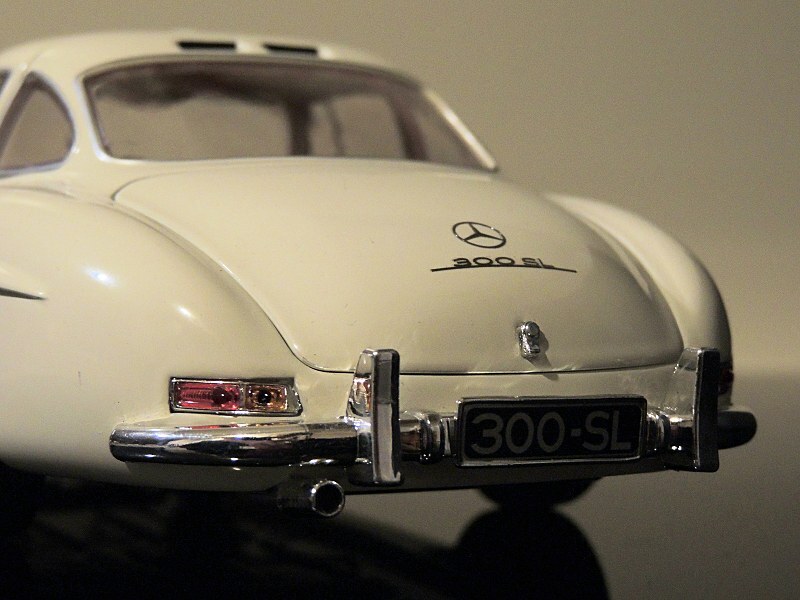 On the Minichamps Gullwing, it’s just one chrome piece, and you could clearly see where it ought to be black. Other than that, they’ve got the Gullwing sculpture, and it can only be described as sculpture, nailed. Trust me, it looks truly beautiful on the shelf. Especially when the afternoon sun glints off the nicely chiselled side louvres. Opening the fabulous Gullwing doors is a slightly more disappointing. The Gullwing doors are not hinged by struts, which would be accurate, but by what I suppose are similar to dogs-legs, albeit on a smaller scale. Not only does this means that there is a clunky piece of hinge housing (with black screws) on the cabin ceiling, it also means that the remarkable spectacle which is the Gullwing doors in full flight, is somewhat tarnished. And for a $190 (AUD) model, it could be better. The interior itself is lovely, and if you’ve only ever known the Bburago, well, it’s just like having a TimTam after having grown up on Digestive biscuits. 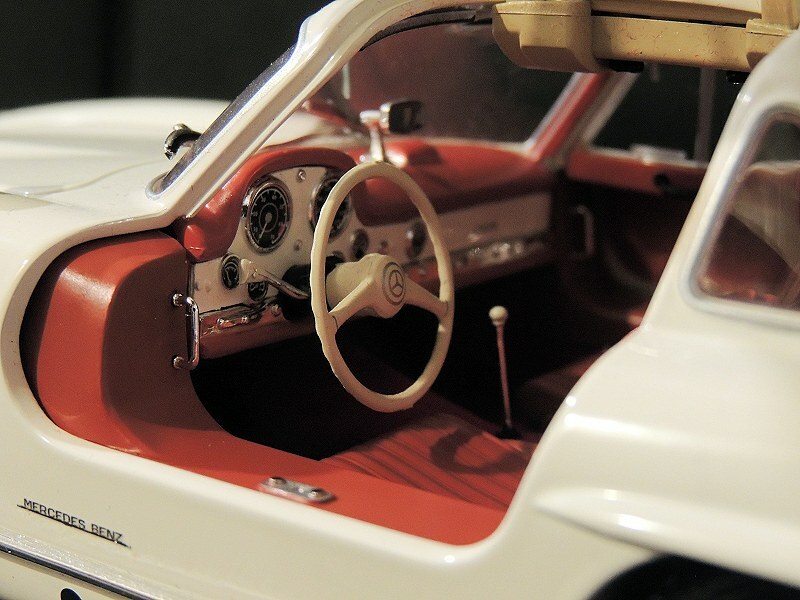 The instrument panel is beautifully presented (except for a little bit of paintwork on the small raised box on the dashboard, perhaps), and the red carpeting is stunning. Especially on the bench behind the seats, where it’s a veritable ocean of deep red. As for the ceiling, with the aforementioned exception of the hinge housing, it’s all a pleasant light beige colour. Unfortunately, it’s only paint, not plastic lining. The underside of the bonnet is a different story, however, as it is indeed lined, with beautifully moulded plastic. The whole engine bay is brilliant. There’s neat piping, detailed warning stickers, and I particularly love the small translucent green bottle of fluid, which has an air bubble in it for effect. The Gullwing was never designed to be practical, and if you open the boot of the model, that’s rather apparent. You could fit more groceries in biscuit tin. It’s entirely taken up with the spare wheel and the fuel filler cap. Both are nicely finished on the model, as is the boot floor with its black carpeting. The underside of the boot, unlike the model, is not plastic lining, but it is matte black paint and that’s good enough. One minor issue though, if it is an issue, is the inconsistency of the boot bulkhead between the Dealer and the standard variants of the model. In the Dealer edition, the bulkhead with its seven holes is painted black, but on the standard variant, it’s body colour. So which is accurate? I’m leaning towards the dealer edition, largely because I have never seen it body-coloured in the few pictures I’ve seen of a Gullwing boot. Which is about one. 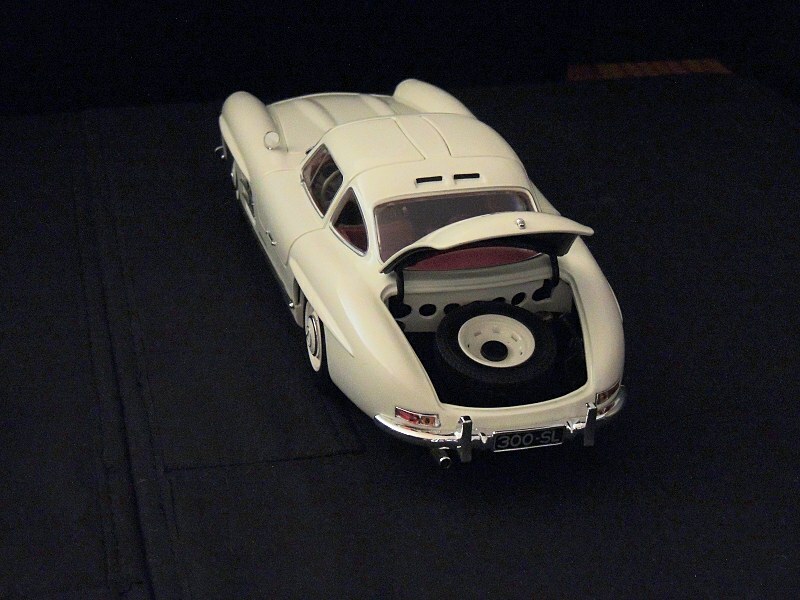 And I’d have to say, overall, that this Minichamps is not quite on par with AUTOart, prior, of course, to that moment of complete imbecility when AUTOart executives realized that since Tupperware charged so much for plastic, they should too. But it isn’t far behind. 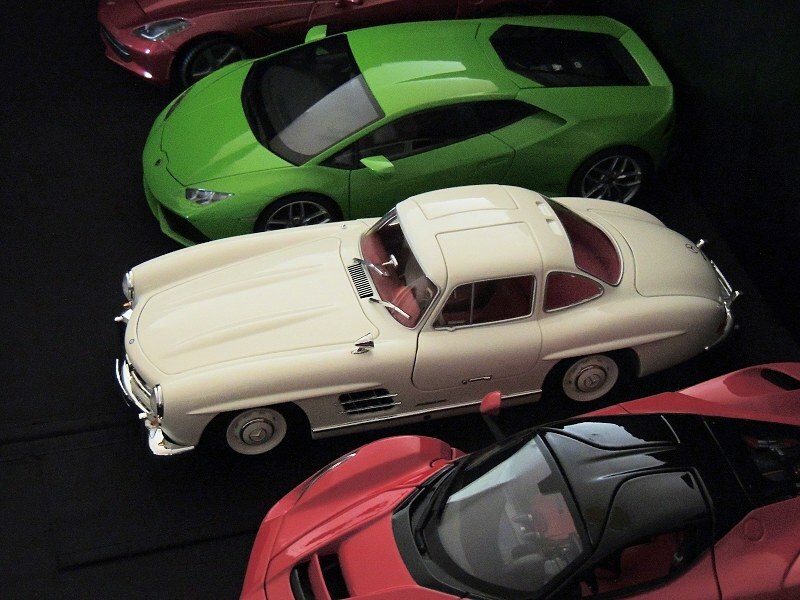 And considering that the only alternative in 1:18 scale is an overpriced toy, and that the Gullwing was and is the grandfather of all great supercars, and is therefore more necessary for your house than toilet paper, what choice have you got? 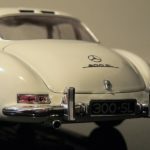 11 Responses to "REVIEW: Minichamps 1954 Mercedes-Benz 300 SL Gullwing"
Great review, thanks for sharing. I’ve had this model for a number of years, the Silver Dealer Edition, just beautiful! I would agree with this statement as well “I think this is the most beautiful car ever made.”. Definitely in the top 5! 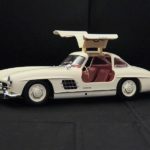 The way Minichamps designed the gullwing doors on this model is the reason I went with their roadster version instead. I bought a red one on eBay. I miss the gullwing doors, but the rest of the model is definitely better made. 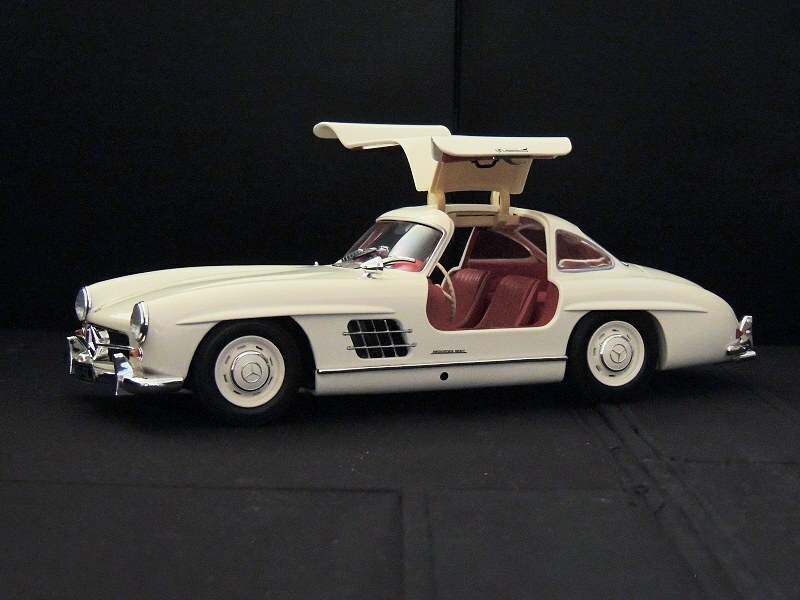 Anyway, for a well made 1:18 gullwing there’s the Ulenhault by CMC. The design is a bit different from the standard 300sl, but the hinges and the lift struts on the doors are beautifully made. 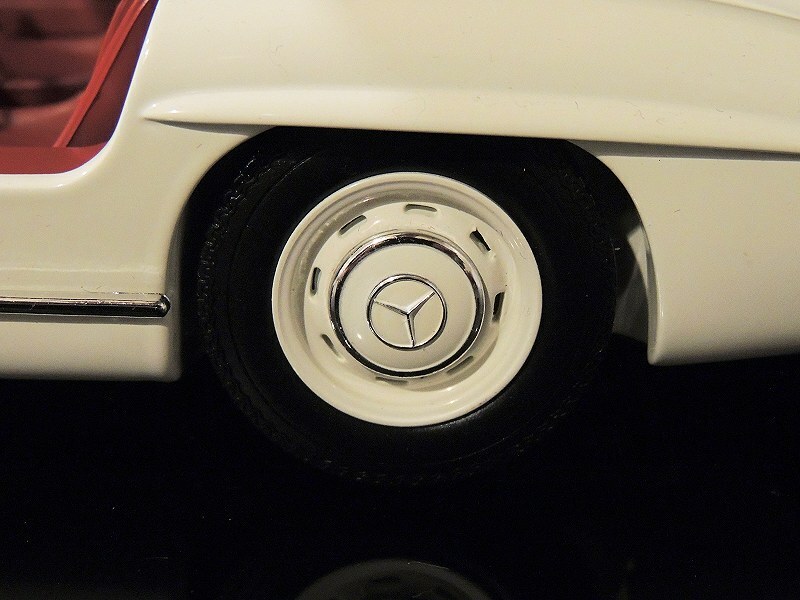 Premium Classixx did a very nice 300sl with realistic hinges and struts, albeit in 1:12. they used to be cheap too. Yes, I get the impression they tried harder with the Roadster version – I mean, there’s even a whole little history written on the box. That’ll be my next review, if I can. Superb pictures and great review. You are spot on. I have the silver DE that is still available in Europe (I think) in the MB lifestyle stores. It sits between my grey roadster and the legendary 300SLR Uhlenhaut from CMC. All great cars. There are also second hand Kyosho versions available on eBay, etc. Surprisingly, the Bburago model’s shape is still one of the most accurate – the Kyosho is too short and the tail of the Minichamps is too long/not curved accurately. But the Minichamps is the best from an overall perspective. But for more accuracy and detail in all aspects, the 1:12 version by Premium ClassiXXs is superb. Hmm, I’m not sure I’d agree with you about the Bburago. I found it crudely out of proportion in places, and the ride height and wheel size was absurd. In my opinion, and feel free to disagree of course, the MINICHAMPS cuts the most accurate profile of the two, though I can’t say anything about the Kyosho or Premium ClassiXX (which I actually looked at before buying this one, briefly). One of the better efforts made by Minichamps. Well, I am a fan of classic Mercedes. 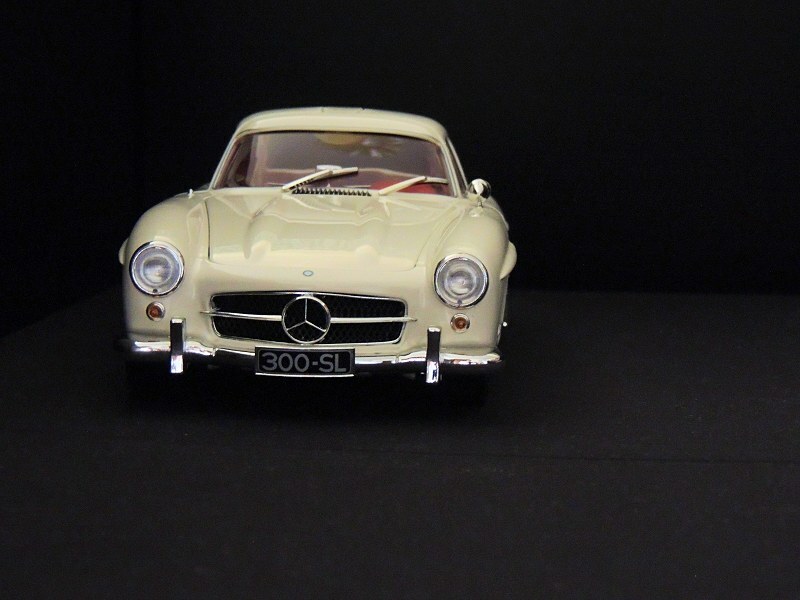 In my opinion, the best 1:18 gullwing is the Minichamps. I have 4 of them: silver, red, black and cream. All have the right black ring on the front markers. So the in the yellow one there is a low quality matter. 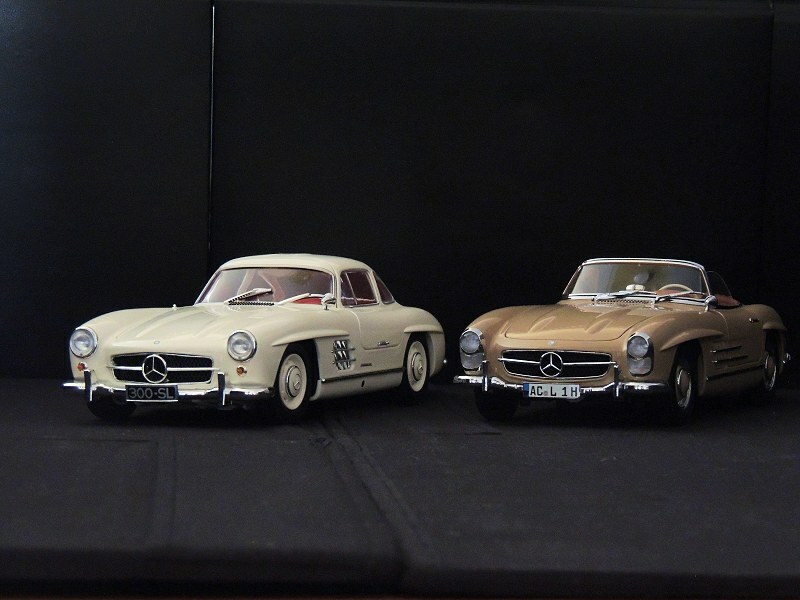 I hope AutoArt will make a good 100% diecast version, of all classic SL’s (not only the 190) in the future. I have the Premium Classixx 1/12 in silver with dark blue interior I would have rather have had more contrast and color ( red not in stock) , but in every way this piece is stellar ! I like big models , though like most of us I don’t really have the space, “Hell”, as it is 1/18 stretches my limits !! Before I discuss the Minichamps, I’ll tell you the 1st Classixx I bought was a BMW 328 which had a plethora of cool detail that forever put on alert to that companies products The Bimmer had a dash that was art , instrument’s had clear faces with dead space btwn face and instrument , seats so soft with sprung carriage that you could depress…… Like wise the 300SL is loaded with great features too numerous to mention ! Aside from comments already touting the Classixx , I’ll tell you of 1 amazing detail ……. The steering wheel like the real one, included a feature designed forr a driver who likes Bratwurst a bit too much so when they cleared the sill getting in and had to get their girth behind the wheel they were then able to collapes the wheel tilting its bottom towards the dash making way for size !! The Classixx, amazingly has the same feature. PRETTY UNUSUAL I find that lately I am leary of purchasing anything made by Minichamps these days I feel they constantly cut corners , in ways not invisible to a buyer. 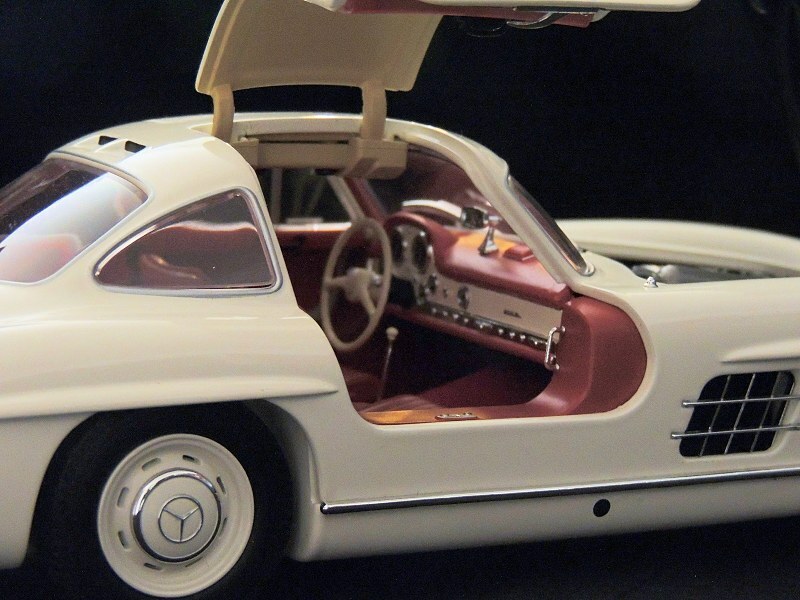 this car has my interest because like (it seems) everyone else I have a real early connection with my Aurora model motoring set and a lovely little 300SL gullwing whose looks hypnotized me I have found a Minichmps Gullwing at a price that makes it hard to resist, Blue W/ red int. So I’m hanging on every word in your review. They often aid me in making good decisions Thanks .